The privacy oriented cryptocurrency platform Zcash [digital asset] is one of the only green-gaining noticeable coins in the cryptocurrency market. Reaching the trading level of $137.87 against the US Dollar, ZEC counts 5.69% increase in the last 24-hours. 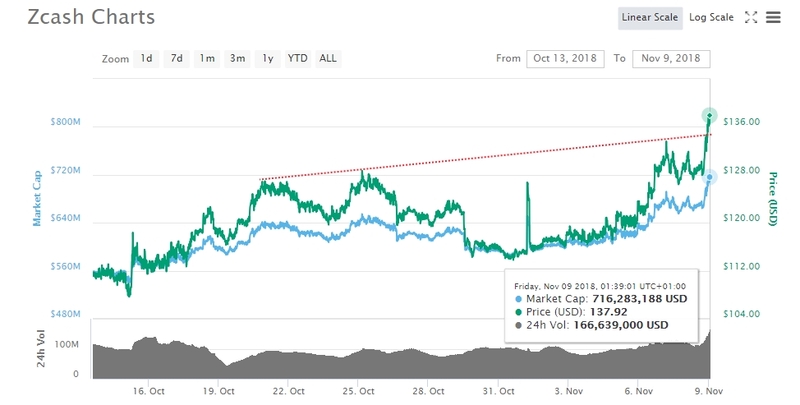 Surprisingly, when most leading virtual assets are struggling to stay in the positive for the day-trade, the pair ZEC/USD achieved a break above the weekly tanking trend line. To know – Professor in John Hopkins University – Matthew D Green – in 2013 introduced the protocol named Zerocoin. At that point it was representing an extension protocol for Bitcoin’s network to gear up the blockchain privacy game. With it users were able to destroy the coins while returning an equal value of them later. Drastic improvements were made later on with the zk-SNARK or Zero-Knowledge Succinct Non-Interactive Argument of Knowledge protocol introduction which could also present a solution for Ethereum’s scaling as highlighted by Vitalik Buterin. A few months ago, Ifdefelse proposed a solution to overcome the pseudo-centralized nature of block generation that specialized ASICs could showcase. Keeping in mind the original idea behind blockchain – fairness and decentralization, it would be impossible to follow it if special miners have the upper hand in generating blocks. By implementing the suggestions made by Ifdefelse team, the Zcash’s network would be more GPU friendly while also more decentralized. Setting the right stone in the right time could attract the needed investors to hoist Zcash and return its gold-rush yet again. Coinbase‘s end-of summer teasing post that it is experimenting with a few coins to be listed, made the specific crypto-assets’ HODLers stay alerted to see how impacting the listing could be and which is going to get listed. Keeping in mind that the latest addition have been ETH tokens [ ZRX or 0x and the Basic Attention Token BAT], the leading exchange could be looking something different from adding this time which could be the heavily-invested in privacy cryptocurrency ZCash. The post The Privacy-Crypto ZCash [ZEC] Price Still Holding Against Seller: Coinbase appeared first on Ethereum World News.